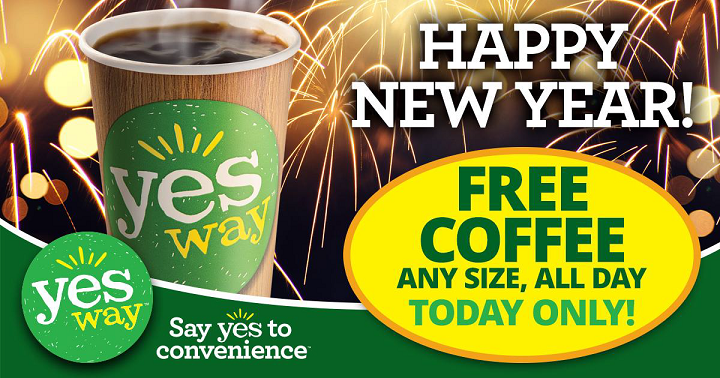 (Des Moines, IA) – December 29, 2017 – Yesway, the fast growing convenience store chain, is giving a gift to its customers this holiday season — free Yesway Signature Blends Coffee on New Year’s Day. Coffee lovers are invited to stop in to their local Yesway store on January 1, 2018 for a free any-size coffee, available all day. Yesway’s three new “customer’s choice” Signature Blends – House Blend, Breakfast Blend, and Dark Roast – debuted in stores in November, having been selected by Yesway customers after extensive in-market taste testing. All three varieties are made with 100% Arabica beans, and brewed fresh, fast and enjoyable at Yesway stores every day. About Yesway – BW Gas & Convenience, d/b/a Yesway, is headquartered in Des Moines, Iowa, and was named a “2017 Chain to Watch” by Convenience Store Decisions. Yesway plans to acquire, improve and rebrand 500 convenience stores in selected regions of the United States over the next several years. For more information on Yesway, please visit the company’s website at www.yesway.com.